Paradise is not lost, but it's in flames - again. The seasonal wildfires that menace this idyllic coastal city roared to life earlier than usual but with all-too-familiar ferocity, burning mansions to their foundations and forcing more than 13,000 to flee. Dozens of homes were destroyed, Gov. Arnold Schwarzenegger said. "I knew it was time to leave," said Tom Morse, 62, a day after he dusted off his motorhome as the fire neared his Mission Canyon Heights house. "I could see the flames getting close." The fire was just the latest to ravage the area known as the American Riviera, home to screen stars, former presidents and Oprah Winfrey. The blaze reached the burn area of another wildfire that just six months ago destroyed about 200 homes in Santa Barbara and Montecito. The latest 1,300-acre fire remained out of control and firefighters were on alert for a predicted return of a "sundowner." Sundowners are powerful, fire-fueling gusts of wind taht arrive late in the day, reports CBS News correspondent Ben Tracy. Super hot and dry air churns down from the mountains and slams through passes and canyons, overwhelming the cool, damp air near the coasts. Sundowner gusts can reach hurricane force - a blowtorch spreading the flames, Tracy reports. A sundowner on Wednesday afternoon turned a slumbering brush fire on rugged slopes above the city into a towering wildfire that hurled flames into homes and spit embers into more distant neighborhoods. Some 5,400 homes were evacuated, and another 13,000 people were advised to be ready to leave. "It started firestorming dramatically," said Gregg Patronyk, a lifelong Santa Barbara resident who grabbed a hose and started wetting his roof when he saw other houses ablaze. "The fire got within 200 to 300 feet of my house. "There was a lot of pressure to leave," he said. "Police wanted me out and I got a frantic call from my sister, who was walking up the hill to get me. So I packed up the car and left, picking her up on the way." Nearly 1,400 firefighters from many departments were on the lines, aided by aircraft. 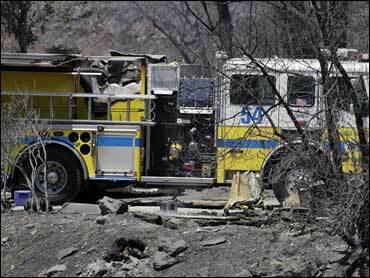 Authorities reported 10 firefighters injured, including three who sheltered in a house during a firestorm. They were in good condition at a Los Angeles burn center but two faced surgery. Other injuries ranged from smoke inhalation to ankle sprains. There were no specific numbers available on property losses. Fire officials would not clarify the governor's estimate, saying assessments were still under way. The city's location on the state's central coast gives it some of the best weather in the world, with temperatures routinely topping out in the 70s, and views of the Pacific Ocean. Now with a population of about 90,000, it dates to the Spanish colonial era of California and a Roman Catholic mission established in the 1780s is a major tourist draw. But the geography that gives it beauty and a serene atmosphere also brings danger. "I'm from the East Coast and at this point I'd rather put up with this than the winter," said evacuee Jim Hatch, 40, an illustrator who returned home to pick up clothes Thursday and motored up Jesusita Road on a baby blue Piaggio scooter to see the fire. State Assemblyman Pedro Nava fled Wednesday with his wife, two dogs and a cat. They tossed pictures, documents and a few days of clothes into a car and went to the home of a friend. "I've learned how important preparation is in an emergency," he said. "The public has to be prepared to move, and in Santa Barbara they are prepared. When the police squad car came through with loudspeakers telling us to leave, there was no arguing. And they will all be back." Morse, the executive director of the environmental group Global Preservation Projects, said he's not surprised by so many fires, blaming it on global warming. "Temperatures are rising and humidity levels are dropping. It means more fires," he said. Global warming can't be blamed for specific fires, but it creates conditions that foster larger and more frequent wildfires, scientists say. "A warming climate encourages wildfires through a longer summer period that dries fuels, promoting easier ignition and faster spread," the Nobel Prize-winning Intergovernmental Panel on Climate Change wrote in 2007. Hatch, the scooter-riding illustrator, said his wife grew up in Santa Barbara. "Her family thinks this is normal," he said. "But after living here for 20 years I think the fires are getting worse." Elsewhere, a southern New Mexico wildfire destroyed three homes and damaged a fourth near the small mountain community of Timberon. It also burned five outbuildings, such as sheds and garages, and 10 vehicles, fire information officer Darlene Hart said. Twenty homes were evacuated.